You are here: Home > News > New Listings-New Dawn for Protection of Built Heritage in Belfast? As the first buildings are listed by issue of Building Preservation Notice since devolved powers in 2015, can this actually be interpreted as a game changer for protection of Belfast’s historic buildings? It goes without saying that the Ulster Architectural Heritage Society (UAHS) welcomes Belfast City Council’s decision to endorse the listing of prominent Victorian buildings 156-164 and 166-174 North Street, the 120 year old Windsor and Merchants buildings. Any action attributing value and protection to the City’s remaining historic fabric, given decades of incremental losses, must deliver due credit to Belfast City Council and the members of the City Council Planning Committee. There was apparent ease in the way that ‘almost listed’ buildings at 97-105 North Street were demolished last year. 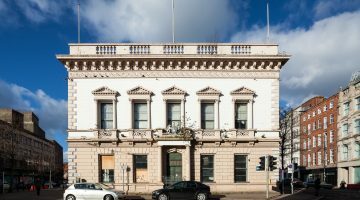 Belfast City Council had been informed of the buildings’ significance and of the intention to list. The Council’s power to serve a Building Preservation Notice (BPN) could have been used to protect the buildings in the interim but no such action was taken. The demolition of these buildings added to the previous loss of the Elephant Buildings and bar, now a carpark, and added further to the almost complete demise of Upper North Street, once one of Belfast’s most attractive principal historic trading streets. Is it therefore optimistic to hope that these listings, following on after the Council did use their power to issue a BPN, are game changing? Does this indicate that Belfast City Council will in future take such steps, routinely and quickly, to better protect our irreplaceable historic buildings before they are lost? In the past, before Northern Ireland local Authorities took over planning powers in 2015, Councillors routinely complained (although rarely in respect of historic buildings) that they were powerless against the centralised Departmental planners. While technically this had some substance it must be remembered that DoE planners were not the City or Borough Fathers….the City Council and its Councillors were, and are. It was, and remains the case today, that the ‘image’ and vision for both visitors to Belfast and its residents, depends on Belfast City Council and Councillors ability to properly assess whether the City’s authentic, as opposed to virtual or invented, former role as an industrial, manufacturing and commercial powerhouse of the then Empire, with Ulster innovation and workmanship renowned worldwide, is the City’s Unique Selling Point. Although this might seem obvious given the City’s former prominence during the Victorian era, the botched and poor quality examples of ‘progress’ development that degrade the City’s remaining historic fabric and open space, not to be excused by the very few good contemporary buildings on show, gives the distinct impression that piecemeal developer profit is the guiding principle. It is not an easy job to serve on a planning committee and with the powers transferred in 2015 come responsibilities which will be analysed retrospectively over many decades. The Victorian City Fathers had an ethic based on good architecture and quality materials, which, then, was a simple doctrine. Today’s planning official and Councillor has to be familiar with a raft of planning policy, social policy, EU Directives and NI legislation, in addition to, inevitably in NI, political considerations. However, of prime importance remains the vision, and in terms of the City’s unique past and how that interacts with the 21st century that broad vision remains absent. Read associated Belfast Telegraph article here.